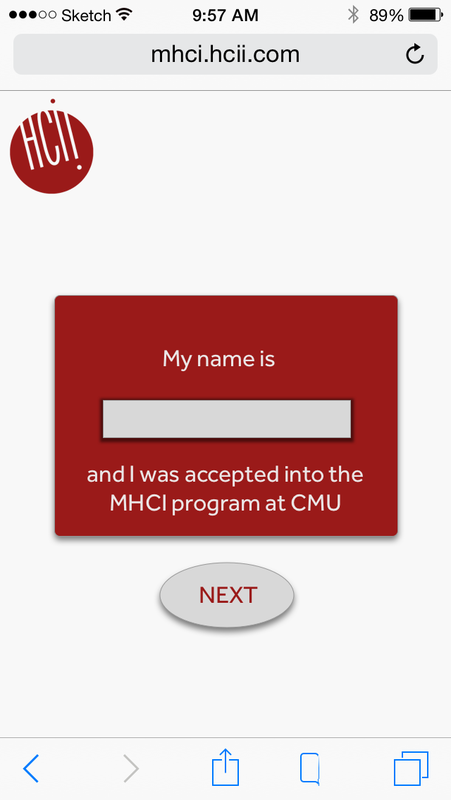 The current system of notifying students of their admission acceptance into the MHCI program is inconsistent and lacking. Some people received their notice of admission over the phone, while others must dig it out of their spam folder in their email. We only had 3 weeks to complete this project. We started in the latter part of September and finished in mid October. Other than our time constraints, we really had no other restrictions. This is a customer journey map of the present indicating where certain breakdowns are taking place and where there may be opportunities for design to facilitate this process. From this customer journey map, we concluded that most of the support desired by the accepted students is in the stage prior to accepting the offer of admission. Across all three interviews, users had expressed issues acquiring information and how frustrating this was. In order to effectively address this issue, we need to find a way to easily get pertinent information to accepted students without overwhelming then and without creating too much work for the administration. We decided to explore a virtual open house. One of our interviewees indicated that the open house was a positive experience, and some didn't get the chance to attend. It would be challenging to completely replicate the experience of open house in a website, and we wouldn't want this to just be a dedicated site for recordings of the open house talks. We need to get the relevant information to the individual student as quickly after the acceptance notice as possible. Our idea would address the "randomness" associated with some of our interviewees reception of the news of acceptance. We wanted this to address both the initial notification of acceptance as well as the desire for more information that immediately follows. We knew that we wanted to reuse the visual motifs of the logo for the HCII, so we decided we wanted to employ circles in the design. In taking a mobile-first approach, we decided what we wanted the desktop to look like after mobile. The login screen is very similar to the mobile. A large difference is the rate at which information is divulged. In the desktop version, all the information relative to acceptance would be displayed on one screen, while it would take three screens to get the same information on mobile. This makes sense being responsive. These mockups draw directly from our sketches and provide greater detail relative to the design and the contents of the page. We want to be brief but specific to the admitted student. We provide tidbits relative to the reasoning behind admitting the student and then follow that up with information relative to the program that pertains to the reasoning. You can see this in the "Why was I accepted?" mockup where the student is told that their interest in accessible design was one of the reasons that they were accepted. They then learn that members of the faculty actually research this field. Not only does the admitted student feel like they have had a personalized experience, but they also learn more about the program. The above mockups are the desktops versions of what was previously seen in the mobile mockups. You can see again that the login screens are very similar. The "Why was I accepted?" area has all the acceptance factors in one area rather than in the mobile version where the factors are on unique screens that are viewed by swiping. Building responsive websites is challenging and it requires a lot of planning up front to do well. I learned that some compromises need to be made relative to how information is relayed in order to maintain the quality of design. I hope that the MHCI administration takes this design idea because it very clear that students need to feel more supported in the admission process. It's a big commitment deciding to get a master's degree, and it's not to be taken lightly. It makes me wonder the people I would have met in the MHCI program had they been given more information and support up front and didn't turn down the offer.